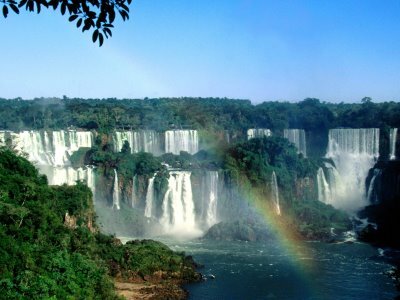 The Igazu Falls are situated on the border between Argentina and Brazil. It can be reached either from the Argentinian city of Puerto Iguazú or from Foz do Iguacu in Brazil. Both of the countries have created a national park around the waterfall, which both have been added as UNESCO World Heritage Sites. The edge of the falls is about 2,7 kilometres long. Along the edge there is about 900 metres of dry land, divided into many small islands. Between the islands there are about 275 separate waterfalls, ranging in height from about 60 metres to 82 metres. About 80% of the falls are on the Argentinian side. To get the complete impression of the falls though, it is best to see the falls from both the sides. 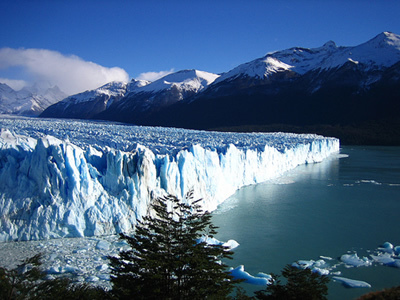 The Perito Moreno Glacier is located in the province of Santa Cruz. It was named after the explorer Francisco Moreno. The glacier ice covers about 250 square kilometers, and it is one of very few glaciers actually growing in size. Sometimes the ice flood can separate the water in the Argentine Lake into two pools. When this happens, the water level on one side can be risen to about 30 meter the height of the other side. This can cause a massive eruption of water when the ice breaks.